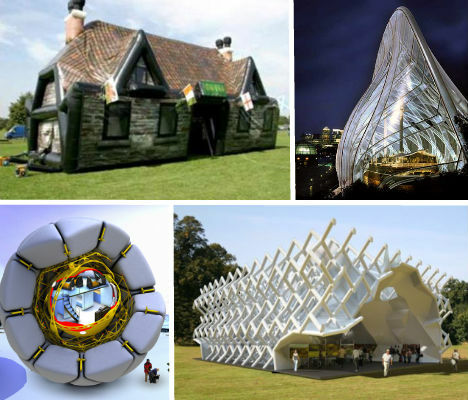 The ultimate in portability, inflatable structures have long been used as temporary housing for all sorts of functions – but did you know there are inflatable pubs, tea houses and research labs? Some are sophisticated designs, using the air as an architectural element or even as insulation, while others bring on the kitsch with puffy plastic pews and airhead angels. Those bounce houses look like so much fun, don’t they? Unfortunately, most of us adults don’t get to enjoy them due to weight limits – but there are other inflatable fun houses that offer entertainment of a different sort. This inflatable pub can be constructed in just two hours and brings a kitschy atmosphere that tents just can’t provide, complete with faux paintings on the wall and a real fire exit right through the pub’s fireplace. Sadly, there’s no bouncing involved, which would actually come in handy after a few drinks. 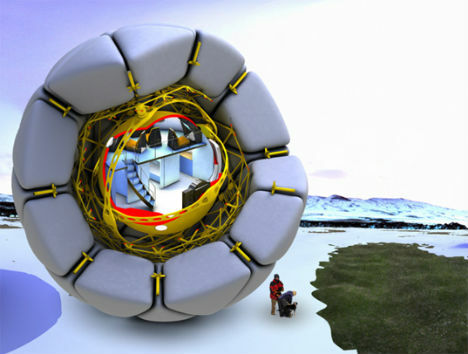 The wind could blow this incredible inflatable research lab around like a beach ball and the crew inside would remain upright and comfortable due to an inner roll-cage. Designed to simply drift along the land on its exterior ‘air bags’, the Arctic Drifter by Studio Les Betes is truly a passive observer of the continent’s landscape and wildlife. 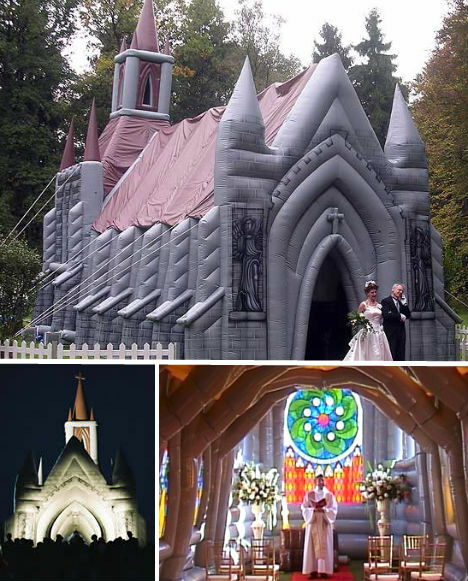 If you’re traditional enough to require a church wedding but eccentric enough to find an inflatable chapel acceptable, there’s simply no choice but to have your very own blow-up church delivered to the site of your preference. A company called Innovations Xtreme produces this highly unusual structure, which comes complete with pews, an organ, an altar, candles, a gold cross and angels flanking the door – all made of plastic filled with air. At night and from a distance, the church looks surprisingly convincing. 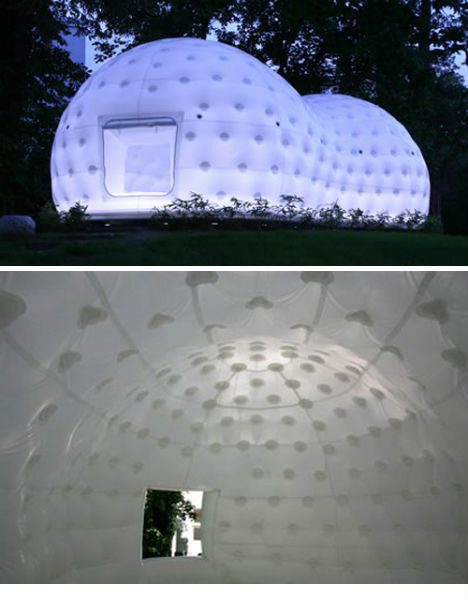 Providing a comfortable, portable, good-looking venue for outdoor events can be a challenge, but this inflatable ‘Bubbletecture’ pavilion has got it covered – literally. The mobile space is easily inflated or deflated and is completely enclosed allowing waterproof, bug-free, climate-controlled entertainment that is also transparent, letting sunlight in and providing a view of the setting. 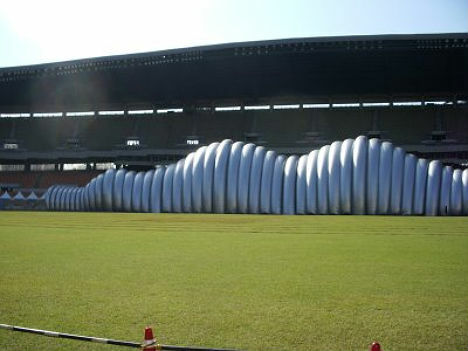 Inside South Korea’s Olympic Stadium during a celebration of the 20th anniversary of the 1988 Olympic Games, which the country hosted, this structure caught the eye of an American visitor with a camera: an unusual inflatable tunnel, reportedly used as a conference room. The tunnel stretched the entire length of the 100-meter sprint and sort of resembles a worm or centipede with its segmented body. Kengo Kuma’s golf-ball-textured, amorphous blob of a building is a long way from the serene wooden structures that most of us associate with Japanese tea houses. But step inside this airy inflatable and you may find that the domed white walls and ceiling have their own sense of peace and relaxation. Tatami mats and an electric stove make for a minimalist setup, but built-in LED lights give it a little something extra at night. 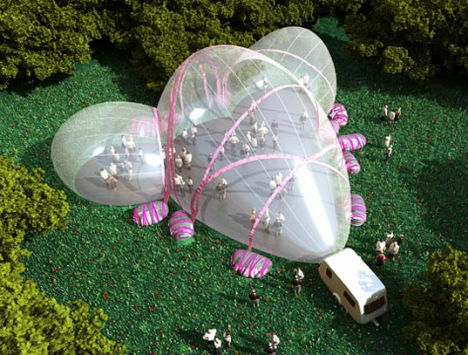 Far more visually striking than a mere tent, the ‘Renaissance Pavilion’ by Various Architects features a diamond-grid pattern of inflatable tubes that inflate in under an hour to reveal a public event space unlike any other. 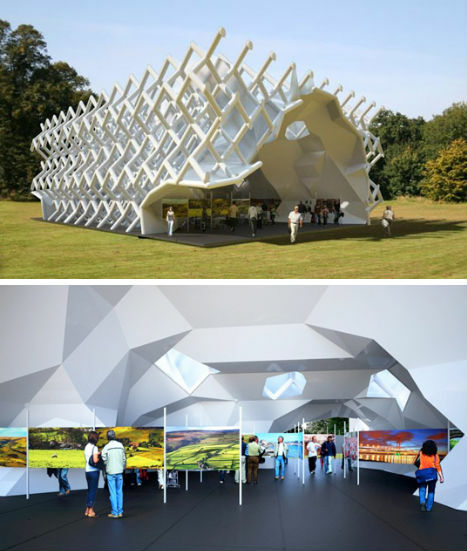 The 100% recyclable pavilion isn’t just super-portable, it also generates its own energy in an innovative way – by mounting solar panels on the shipping container used for transport, and wind turbines gather additional power on-site. 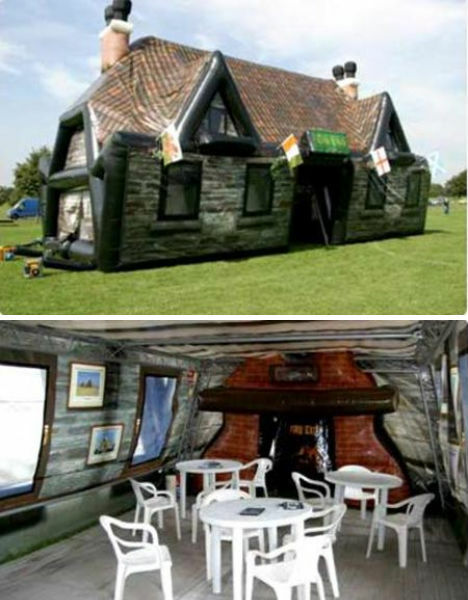 Is the inflatable pub just not quite big enough for your needs? Perhaps nothing less than a palace will do. Well, they’ve got that, too. Because nothing says ‘luxury’ like air-filled plastic. 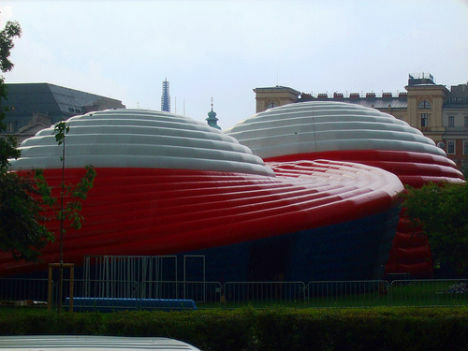 The world’s largest inflatable tent was deployed in 8 host cities around the world during 2008’s EURO Experience Tour, part of the Euro Cup festivities. Inside the tent – which resembles a pair of grounded UFOs – was a 140-seat movie theater. The tent measured about 45 feet x 130 feet x 200 feet and weighed ten tons. How do you protect a priceless antique ship while restoring it, without moving the ship itself? Put it in a bottle. That’s what the Grimshaw architecture firm proposed in 2004 for the Cutty Sark, currently permanently ‘dry-docked’ in London. Grimshaw imagined building a giant inflatable enclosure around the ship so visitors could still peer inside and watch the restoration. Ultimately, Grimshaw’s design changed drastically, ditching the inflatable concept for canvas sheets and a wooden frame, and neither design would have done anything to prevent the 2007 fire that nearly destroyed the ship. 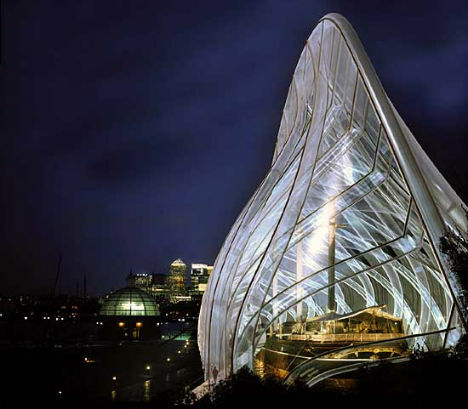 Like a sail, the Air Forest pneumatic pavilion doesn’t need to be pumped full of air artificially; it simply catches the wind. This shimmering design by Mass Studies, covered in little silver circles that reflect its environment, stays inflated using passing wind currents. Anchors keep it from taking off into the sky, but the whole structure changes as often as the wind itself, shifting with each new breeze. 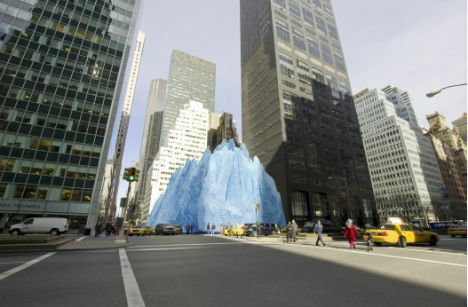 Not all inflatable architecture ideas have to use air for the entire building. 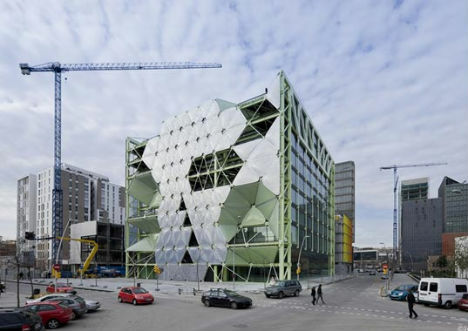 This design by Enric Ruiz Geli updates an old disused building in Barcelona with an inflatable facade that doesn’t just beautify the structure, but actually regulates sunlight and temperature. 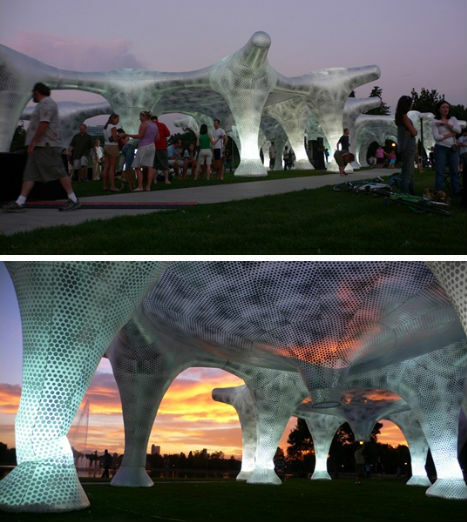 The skin is made from chambers of a plastic called ETFE which expand and contract as the sunlight changes throughout the day.